Mesa Verde National Park is a beautiful historical park dedicated to preserving hundreds of Puebloan dwellings and artifacts. The artifacts and dwellings date back to a period of time spanning from 550 AD to shortly before 1300 AD. The vast history on display for the public to enjoy at Mesa Verde is astounding. The large majority of attractions at the park are located approximately thirty miles inside the park, making it fairly long drive. However, in the colder months, you can take in gorgeous views of snow-capped peaks in the background as you enjoy the meandering mountain road. The visitor's center is closed until May, so the first major sightseeing area you will reach is the Chapin Mesa Archaeological Museum. At the museum, you can learn more about the park by speaking with a park ranger. The museum itself features a short and educational movie that replays every thirty minutes, as well as interesting displays, artifacts, and dioramas about the ancient Puebloan culture. There is also a small restaurant serving a la carte items, offering both indoor and outdoor seating. Just behind the museum is the beginning of a short but steep trail to the Spruce Tree House. Visitors are permitted to walk up to the dwelling and even enter certain areas, such as a below ground chamber. This dwelling can be enhanced with a self-guided tour, available via a brochure at the trail head. Many other dwellings can be viewed from a road tour in the comfort of your own car. Two separate roads offer you the chance to get out of your car at several stops to explore various villages, pithouses, and other cliff dwellings. The pithouses and villages offer up-close views, giving you the opportunity to stand above these in-ground structures and peer into them. At each location, there are educational displays giving you more information about the sites. In colder months, the other major dwellings, such as the Balcony House, Long House, and Cliff Palace, and others, are not available for up close viewing, and some cannot even be seen from a distance. During the off-season, you can expect to get a full experience in approximately four to six hours at the park. 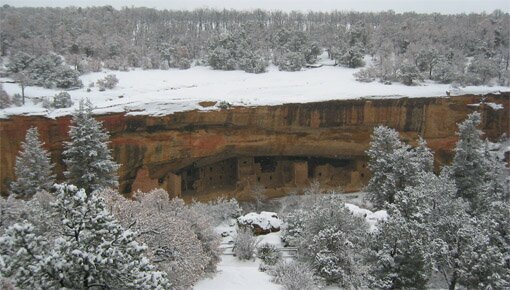 While a trip to Mesa Verde National Park in the colder winter months can be disappointing for those expecting a full deluge of Puebloan culture and history, an off-season visit avoids the crowds and offers an excellent opportunity to learn more about the culture of ancient Native American Indians from rangers that may have more available time to answer your questions. Regardless of the season you visit the Mesa Verde National Park, you will be amazed by the vast history on display during your visit. Read more detail about Mesa Verde National Park including directions on how to get to the park from Durango CO, maps, park layout, self-guided tours, fees for ranger-guide tours, pictures of the cliff dwellings and much more.